Самолет оказался удачным, по летным характеристикам он мало в чем уступал одноместным сухопутным истребителям, а по такому показателю, как сектор обстрела подвижной пулеметной установки, не имел себе равных. Он применялся в качестве истребителя, разведчика и бомбардировщика, а также для нападения на большие торговые суда в Северном море, действуя с баз Зеебругге и Остенде (Бельгия). Зафиксированы случаи, когда W 12 атаковали военные корабли и подводные лодки. В поединках с гидросамолетами Антанты W12 часто выходили победителями, поскольку имели превосходство в скорости, маневренности и вооружении. В декабре 1917 г. один из них сбил британский мягкий дирижабль С.27. На W 12 летали известный ас немецкой морской авиации, командир базы гидросамолетов в Зеебругге Фридрих Христиансен. Его самолеты просто терроризировали французский Дюнкерк они постоянно меняли тактику нападения, что не давало союзникам возможности организовать эффективную систему ПВО. В процессе производства был создан ряд различных модификаций этого самолета. Так, патрульный вариант W 19 с двигателем Майбах Mb.IV (260 л. с.) имел увеличенные размеры и запас топлива, что позволило в полтора раза увеличить продолжительность полета. Таинственный самолет W 27 отличался I-образными межкрыльевыми стойками и двигателем Бенц Bz.III (195 л. с.). W 32 был похож на тот же W 27, но оснащался двигателем Мерседес D.III (160 л. с). Всего было произведено 146 машин. 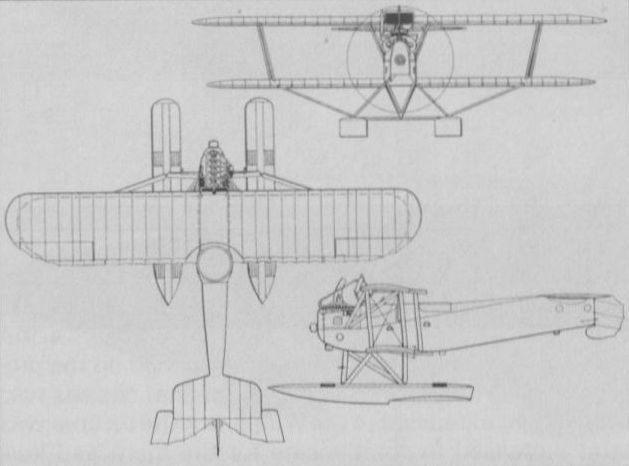 Work was begun on the Brandenburg W 12 in the autumn of 1916, in response to a request from the seaplane stations for a defence fighter equipped with a machine-gun to fire rearwards. 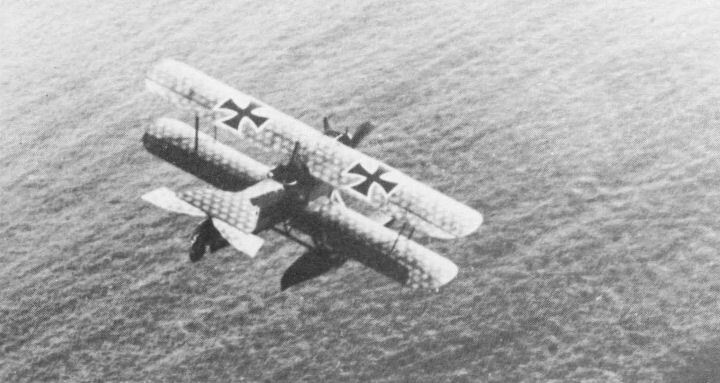 Although the single-seat defence fighters (Albatros W 4, Brandenburg K.D.W., etc.) had proved a useful weapon to the naval service, they were completely defenceless against attack from the rear, and a solution to this vulnerability was sought in the design of the W 12. The elevated siting of the rear gun mounting gave an excellent all-round field of fire, including forward over the top wing. In addition, the aircraft itself was technically first class, for in spite of its weight and size, it was in no way inferior to the single-seaters in speed and manoeuvrability. The single-bay wings and absence of interplane bracing cables were a unique feature on a two-seater seaplane, and undoubtedly contributed to the excellent performance. 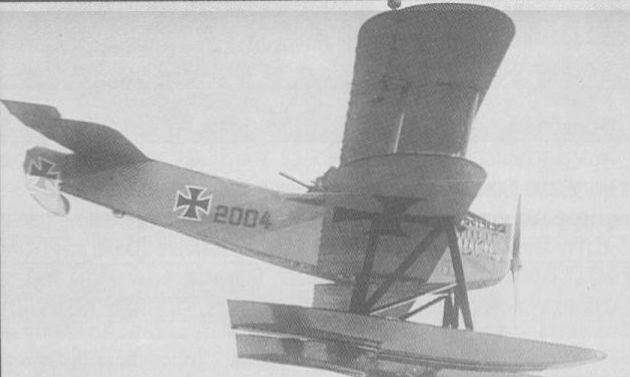 In January 1917 the prototype was completed at Briest works, but due to the water on the Havel River being frozen, it was shipped to the seaplane test establishment at Warnemunde. The initial test flight was a somewhat hectic affair in which the aircraft proved excessively tail heavy; however, a safe landing was contrived, and overnight modification of the wing structure corrected the centre of gravity and rectified this disconcerting trait. Although this prototype was later written off in an unlucky landing in breakers, the results thus far achieved, both in performance and general flying qualities, inspired sufficient confidence for a first series order to be placed. The designer of the W 12 was Ernst Heinkel, who had fathered earlier successful designs from the Hansa Brandenburg works and who, a couple of decades later, was to produce the famous bombers from his own factories. As subsequent batches of W 12s were produced, so they differed slightly in detail, as seems to be inevitably the case with the majority of German naval aircraft types. However, the basic airframe remained substantially the same. 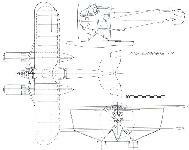 The fuselage was based on four main spruce longerons and spacers, with robust multi-ply formers forward of the cockpit supporting the engine bearers. The power-plant was either a 160 h.p. Mercedes D III or a 150 h.p. Benz Bz III according to series batch. Those with Mercedes motors were fitted with leading-edge-mounted radiators while W 12s with the Benz installation had a car-type radiator at the extreme nose. Immediately of the engine bearers, the longerons raked upwards towards the tail to give the elevated position for the gun mounting, which bestowed the improved field of fire. The slab sides tapered to a vertical knife-edge aft, with little or no taper in elevation, resulting in an extremely deep section at the tail end. This additional side area compensated for the float area and lack of vertical fin. The fuselage was plywood covered, and windows were provided in the floors of the cockpits to give improved downward visibility. The wooden cantilever tailplane was much thicker in section at the centre, and because of the resultant increase in airflow disturbance, the steel-tube-framed elevators had to be re-designed with a considerable degree of inverse taper to improve effectiveness. Mounted on top of the fuselage, the tailplane was well clear of the spray when taxi-ing, and the absence of bracing struts enabled the gunner to fire under the tail quite close in to the fuselage. The fabric-covered steel-tube rudder was attached to the fuselage sternpost, the balance portion extending below the fuselage to leave the area above the tailplane unrestricted for firing. The wing structure was made compact and additionally strong in order to dispense with interplane bracing cables, enabling the gunner to fire through the wings. Construction was orthodox, although a deep aerofoil section was employed to provide the required strength factor. Plywood ribs, flanged with soft timber, were closely spaced on the two spruce main pars; both wings were of constant chord and, after the first batch of six aircraft, had rounded tips. The upper wing was a one-piece structure scured to the centre-section struts; the cut-out was shallow in the first batch, but the reduction of stagger in later series necessitated a much deeper cut-out. Ailerons of welded steel-tube framing were fitted, and control cables were designed to provide independent operation should any combat damage occur. Later batches of aircraft were fitted with four ailerons, connected with a link strut, and the ample aileron area contributed to the W 12's outstanding manoeuvrability. The floats were supported on a chassis of steel-tube struts, faired with plywood and attached with ball joints. Additional "N" struts braced the floats to the wings at the junction of the interplane struts, lending additional rigidity to the wing cellule. The floats themselves were of wood; a basic framework of formers and stringers being covered with high-grade maritime three-ply. On entering service with the seaplane stations, the Brandenburg W 12 soon proved itself an excellent weapon against the Allied seaplanes. Particularly pleased to receive the W 12 were the pilots at Zeebrugge, who had suffered at the hands of the large, well-armed, British flying-boats in the North Sea. Oberleutnant Christiansen soon distinguished himself as a capable exponent of the W 12, and probably his most spectacular victory was the shooting down in flames of the British non-rigid airship C 27 on 17th December 1917. A colleague of Christiansen's at this time was a midshipman, von Wyk, who between the wars became famous as the pilot of the giant twelve-engined Dornier Do X.
W 12s were also operated on reconnaissance, often venturing to British coastal waters. When used on such duties one of the forward-firing guns was dispensed with and radio apparatus carried in its stead. Manufacturer: Hansa und Brandenburgische Flugzeug-Werke G.m.b.H. One 160 h.p. Mercedes D III 6 cylinder in-line water-cooled engine. One 150 h.p. Benz Bz III 6 cylinder in-line water-cooled engine. Dimensions: Span, 112m. (36 ft. 9 in.). Length, 9 6 m. (31 ft. 6 in.). Height, 3.3 m. (10 ft. 10 in.). Area, 35.3 sq.m. (381.25 sq.ft.). Weights: Empty, 997 kg. (2,193.4 lb.). Loaded, 1,454 kg. (3,198.8 lb.). Performance: Maximum speed, 159.5 km.hr. (100 m.p.h.). Climb, 1,000 m. (3,280 ft.) in 7 min. ; 2,000 m. (6,560 ft.) in 18-9 min. Ceiling, 16,400 ft. Endurance, 3 1/2 hrs. Armament: One or two fixed Spandau machine-guns and one manually operated Parabellum in rear cockpit. 1011-1016, 160 h.p. Mercedes, two machine-guns. 1178 1187, 150 h.p. Benz, two machine-guns. 1395-1414, 150 h.p. Benz, two machine-guns. 2000-2019, 150 h.p. Benz, two machine-guns (except 2016 above). 2023-2052, 150 h.p. Benz, three machine-guns. 2093-2132, 160 h.p. Mercedes, two machine-guns. 2217-2236, 160 h.p. Mercedes, two machine-guns, also radio fitted. A single-bay twin-float two-seat fighter biplane, the W 12 was flown for the first time in January 1917 with a 160 hp Mercedes D III six-cylinder water-cooled engine. Of wooden construction with plywood fuselage skinning, the W12 was produced for the German Navy with both the 160 hp Mercedes D IIIa engine and the 150 hp Benz Bz III, and proved outstandingly manoeuvrable. Its first operations were conducted from the seaplane station at Zeebrugge, from where it quickly distinguished itself in service. Standard armament comprised one forward-firing synchronised 7,92-mm LMG 08/15 machine gun and a Parabellum of similar calibre on a flexible mount in the rear cockpit, but of the 146 W 12s that had been built when production terminated in June 1918, one batch of 30 Benz-engined fighters had been delivered with a forward-firing armament of two LMGs. Max speed, 99 mph (160 km/h). Time to 3,280 ft (1000 m), 7.0 min, to 6,560 ft (2 000 m), 18.9 min. Empty weight, 2,198 lb (997 kg). Loaded weight, 3,205 lb (1454 kg). Span, 36 ft 8 7/8 in (11,2 m). Length, 31 ft 6 in (9,60 m). Height, 10 ft 10 in (3,30 in). Wing area, 389.66 sq ft (36,2 m2). 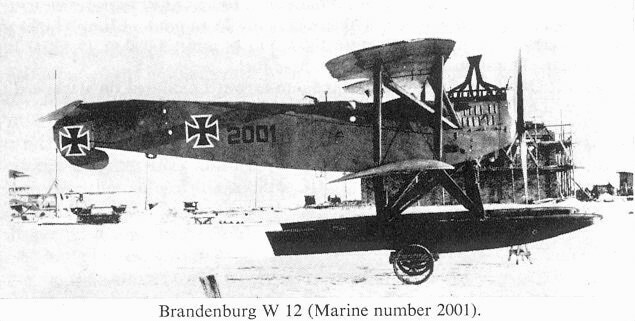 This Brandenburg W12 was flown operationally from Zeebrugge in early 1918 by Leutnant Becht of the Imperial German Navy Air Service. Designed by Ernst Heinkel, the W12 float fighter proved exceptionally successful. Christiansen flying one of the early production Brandenburg W12 seaplanes powered by a 150hp Benz engine. This aircraft, 1183, served at Zeebrugge for eight months before it was destroyed in a bombing attack on the Mole on 10 May 1918. Designed by Ernst Heinkel late in 1916, the W12's performance was equal to that of the single-seat seaplanes then in service. Capable of 160km/hr (100mph), its rate of climb and general manoeuvrability made it popular with the crews, who gave it the name 'Kamel'. 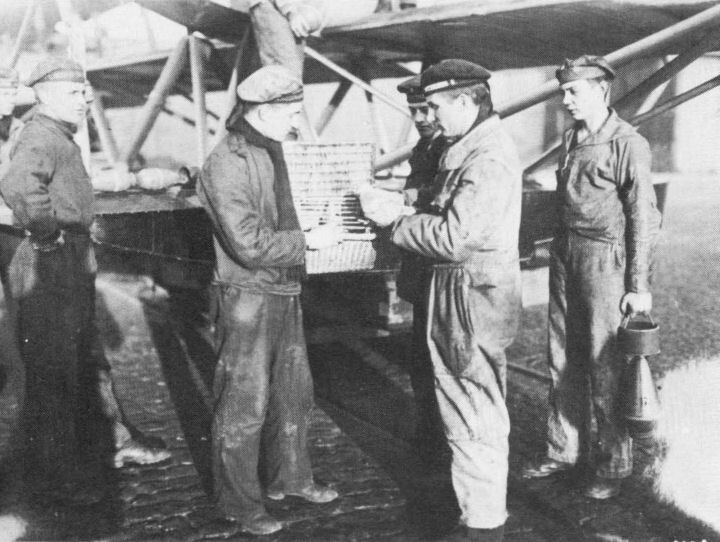 Carrier-pigeons formed an important part of the equipment of seaplanes. The birds were released with position information if a machine was forced to land on the water, and many crews and aircraft were saved as a result. 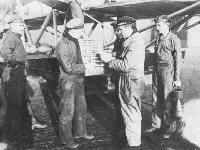 While Brandenburg W12 1399 at Zeebrugge is bombed-up prior to flight, pigeons are checked into their special wicker basket for stowing on board. Brandenburg W 12 (Marine number 2001). 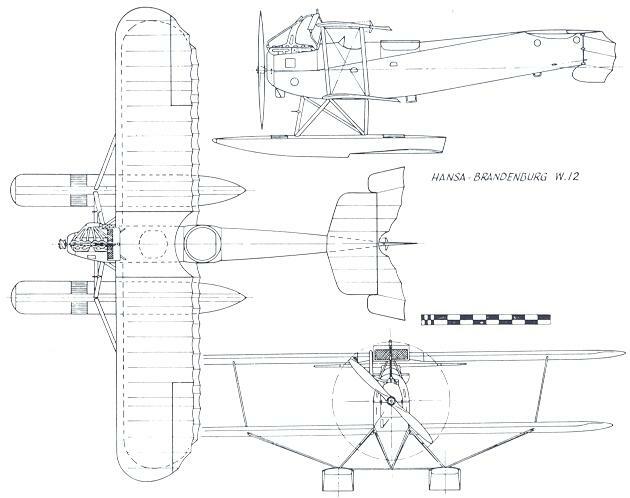 The Hansa-Brandenburg W 12, another of Ernst Heinkel's creations, was a float-equipped, two seat reconnaissance fighter that first flew in January 1917 and started to replace the single seat Albatros W 4 from April 1917 onwards. Powered by either a 150hp Benz Bz III or 160hp Mercedes D III, the W 12 had a top level speed of 99.4mph and a ceiling of 16,400 feet. The machine seen here, serial 2016, was a Benz-equipped early production example. Armament comprised one, later two fixed, forward-firing 7.92mm Spandaus, plus the observer's flexibly mounted 7.92mm Parabellum. W 12 deliveries began in April 1917 and ended in March 1918, totalling 145 machines, excluding the prototype that had been destroyed early in flight testing. 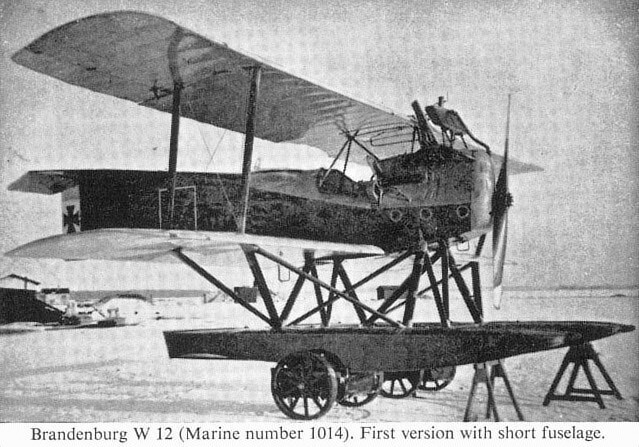 A Brandenburg W.12 Sea Biplane of 1918.